I was going through my journals the other day, and LOVED looking back at the older stuff, and being able to acknowledge that my skills ARE improving. To that end, I started rummaging around in my studio, and I also found an assortment of things I’d drawn that never made it into a journal because they were done on scraps of paper, or as an experiment, or were intended as postcards or Christmas cards that never got mailed, etc etc etc…. Anywaaaaaaaaay, it kinda dawned on me that I could fill up the empty pages of some of my journals with these odds-‘n-ends pieces, and kill two stones with one bird. As I get “completed” journals, I’ll post them, and I’ve decided to even post the icky, pathetic, badly done pieces – YIKES! I only use my journals for creating art, I don’t ever use them to write in. I do use them to record events that happen on trips, to a certain degree, but mostly just to keep getting better at drawing. sooooooooooo probably NOT a good idea to start a word journal……. This entry was posted in ArtEveryDay, Drawings, Journal, Moleskine, Travel Journal, Watercolor and tagged Art Every Day, drawing, journal, moleskine, Postcards, Travel Journal, watercolor. Bookmark the permalink. 7 Responses to Old Journals…..
As for the cat food you said you were hungry. I don’t think it was me with the egg but I did hear that eggs really cleans the hair and leaves it nice and silky (mayby it was me)!!!!!!!! You got this far without growing up so why bother now. Trust me, it was you with the egg…. and I agree, I have to get old, but I DON’T have to grow up….. When did you do the blue fish? This trip? It is my favourite. 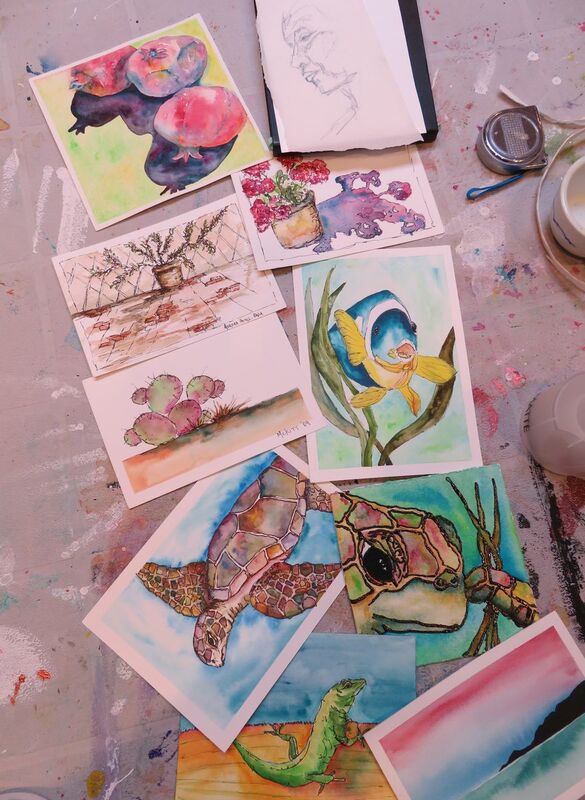 Some previous Hawaii trip, and it would’ve been drawing with you, I’m sure…. Thanks. And I am even MORE impressed by your faces, jeeze they’re good! Thank you so much! I appreciate your kindness.